By Sara Golaski - MSc student. We’ve just finished up another busy couple months of fieldwork in Lüderitz, with lots of time on the water, and a few more interesting sightings! During this year’s two-months in Lüderitz, we did 16 photo-id surveys (a total of 93 hours on the water) covering 868 kilometers. In total, we took 8595 ID photos! The information from these surveys is being used to look at abundance, population trends and habitat use of Heaviside’s dolphins. We also did three multi-day ship surveys, a continuation of our work looking at cetacean distribution within the Namibian Islands Marine Protected Area. We covered a total of 2176 kilometers in our 171 hours on these surveys and had 58 cetacean sightings from the ship. We also had five acoustic loggers in the water listening for dolphin clicks throughout the field season (see top map). 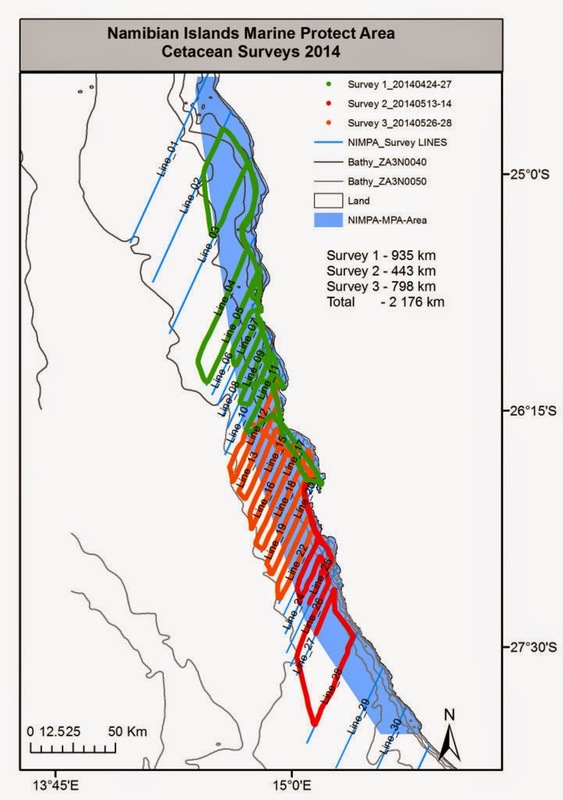 This data will be used to examine temporal patters in fine-scale movements of Heaviside’s dolphins around Lüderitz. This is important to ground-truth our survey data for defining dolphin habitat because we aren’t out late in the day or at night. Fieldwork in Lüderitz is always exciting, because there are so many opportunities for Heaviside’s encounters and we really never know exactly what we’re going to find. Interesting sightings from this year include the southernmost sighting to date of the inshore bottlenose dolphins from Walvis Bay and the first sighting of fin whales inshore in Namibian waters! We also had 5 humpback whale sightings, including a feeding pair and a surface-active mom/calf pair. Humpbacks are usually seen migrating through between June and November, so these sightings are important for highlighting “out of season” use of this area. We even had a very rare sighting of southern right whale dolphins in the distance from the ship! When we aren’t at sea we keep ourselves busy with office work too. Other accomplishments this field season include 1 paper submitted, 1 back from review and being corrected, 3 finished and with co-authors for comment. A great big thank you to Jean-Paul Roux and Kolette Grobler at the Ministry of Fisheries and Marine Resources and M&Z Motors for their support in making our field season possible.